In every war that has taken our boys overseas, there has been one constant. Whether in the trench's of Europe in WWI, the South Pacific, North Africa, or Europe in WWII, Korea, or Vietnam, the dog has been by our side. 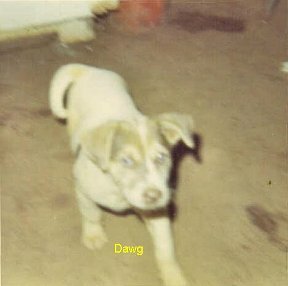 It may have been a trained K-9, or just a mutt hanging around the compound, but the dog was there. It gave us a sort of link to home; someone to pet or talk to. You could tell a dog anything and he would not judge you or turn away. If you were so inclined you could read your mail to him and discuss the contents, not having to worry your secrets would be told. Yes, the dog was there for you when it seemed that everything and everyone was against you. At HHB 6/27th we had several dogs. First there was George. He was sort of the number one dog. Now George loved to ride shotgun in a jeep no matter who was driving or what was going on. Example - I was going to the other side of the airstrip one day, and George jumped in the jeep with me. As we were driving along I spotted a lieutenant walking along the road. I pulled over to give him a ride. He saw George and started to get in the back of the jeep. I pushed George to the back so the Lt. could sit in the front. All the way to where we dropped the Lt. off George just stared at him. I could see the Lt. was a little worried about this so I explained that George was just mad having to give up his seat. After I dropped the Lt. off George hopped back in the front and all was good again. George also kept me and others company when it sounded like the world was coming to an end. That's how and why he was awarded a Bronze Star. 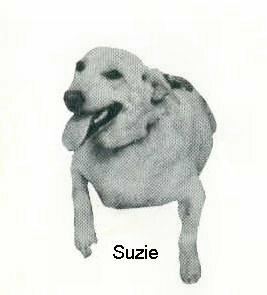 We also had two dogs that looked alike; Suzie and Judy. They were just a couple of dogs that would give you love and understanding. They would listen to you while you scratched there belly and ears. They were nothing special, just good listeners that could keep a secret. R.T.T. had a pup we just called Dawg. Again nothing special, just someone to not pass judgment on whatever you may have done, and keep you company on those long dark nights. Then there was Dickbird. Now Dickbird was sort of goofy looking, kind of a cross of everything. She had short legs and a long body, and a face only a mother could love. (or a soldier far from home). Well dogs being dogs and nature going unchecked, Dickbird had a litter of pups, and just before they were fully weaned she was hit by a Duce and a Half. The truck didn't kill her, but she was unable to nurse her young. I guess there wasn't a Veterinarian at Quan Loi, so they decided to send her to Long Binh for care. I was chosen for the mission of getting her to Long Binh by way of convoy. I took this very seriously, for I was told to bring her back healthy. We arrived in Long Binh and I set out looking for the Vet's office. After about an hour or so I found it and took the Dickbird inside. The vet looked her over as I explained to him what had happened, and about the pups. He gave her a shot and cut part of her tail off and put some salve on her. Then came the paperwork. First question – Unit? Next question, dogs name? For the first time I felt a little foolish saying "Dickbird". The vet looked at me with that “you've got to be kidding” me look, then wrote it down. There were more questions. After leaving the Vet's office it was getting close to chow time, so I tied the dog to the vehicle and went to get something to eat. I planned to bring some scraps back to Dickbird. I finished eating and went to give her the scraps and some water. When I got to where I could see the truck I realized the dog was gone. She had somehow managed to slip out of the collar I made and had run off. “Oh boy, I'm in trouble now,” I thought. I have lost the dog they trusted me to take care of. I started to panic after about an hour and not finding her. Then I spotted her walking down the road being nosy. I don't know how it looked, but again I felt foolish yelling "Here Dickbird, come here Dickbird". I finally got her and gave her the food and water (not that she deserved it) and made sure she was tied good and secure for the night. When I was sure she couldn't get free I went to bed. The next day we had an uneventful trip back to Quan Loi. When we pulled into the battery there was a welcoming committee for her and my job was done. Yes, Dickbird was back with her pups and nobody knew what a lousy time I had, and the joke around the battery was "what Dickbird's been medivaced". I truly believe the presence of dogs made that place more tolerable, and I was thankful for them being there. 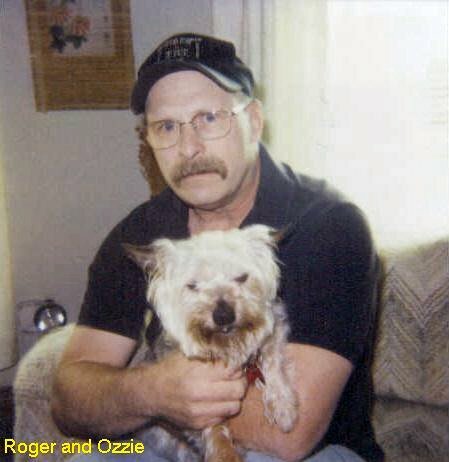 Editor's Note: Obviously, you can see after reading this story that Roger is a longtime dog-lover. Do you think he owns a dog today? Click here to find out.